Our Everlasting Soothing Lavender Bouquet combines enchanting fresh flowers in majestic hues of lavender, violet and lush greens in a beautiful cube vase. 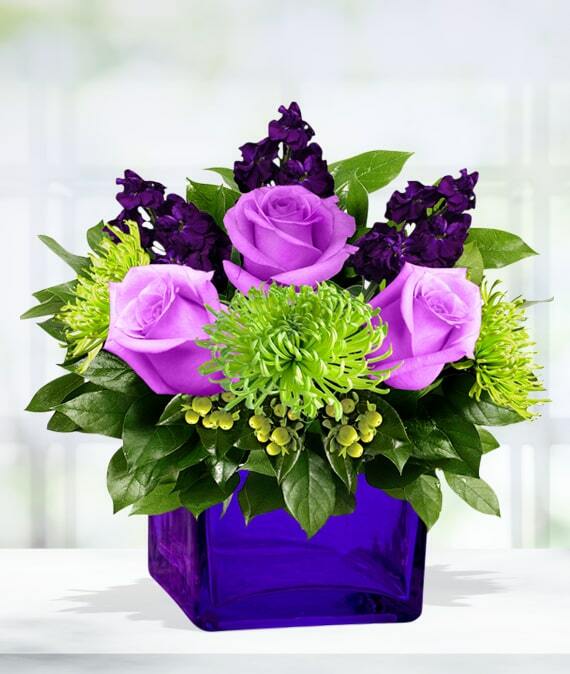 This arrangement displays their appreciation for the color purple and your appreciation for them. 03/26/2012 12:57PM Ordered this to a hospital because my mom was sick. It arrived on tiem and looked great thanks Avas! !— Michelle P.
09/26/2011 4:40PM If you're a fan of purples and lavender then this lovely lavender arrangement is just perfect. I love how the purple bow and vase bring the whole arrangement together.— Shelly T.